Good thing Maxime wasn't picking up the dinner tab. Apparently they grow 'em big up there in the 'Burgh! Speaking of which, I'll be at PNC for the Dodgers game on June 2nd (Adam LaRoche bobblehead night no less). Anyone have season tix or might end up there that night? Maybe we can have a Mondesi-style pre-game at a local bar (suggestions welcome for this out of towner). Adam, if you show up make sure you're rocking the Amaechi throw back jersey so we can easily find you. Primanti Brothers. Best sandwiches around. They have one at the stadium or go to the original in the Strip District. Also Fat Heads on the Southside is a good wings and beer joint. haha just saw the Amaechi thing. i really have no rebuttle. 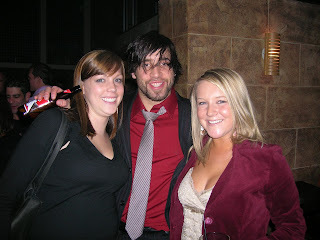 Talbot reminds me of the drunk foreign exchange student in the movies that will get hammered and bang anything. I don't know if such a character ever actually existed in a movie... and I guess being french-Canadian counts as being a somewhat foreign exchange student-like. So uhh yeah, it's a good analogy. Louis, Sixteen Candles, that Dong fellow had himself a bigin'. That might be the movie you were thinking of. These women give me hope that I could meet a drunken Malkin and make him fall in love with me. Whassa happenin' hot stuff? I think the Donger's chick was better looking than these two. So a North side stumble before the game, and a South side stumble afterwards is recommended? As long as I can get hot wings and some cold Arrrn City then I'm good.